Kheema Paratha is basically a flat-bread that is stuffed with ground meat mixture. In Burma, when we use the word Paratha, we are referring to flour based (instead of whole wheat) flaky, layered and crispy type of Paratha, also known as Lacha Paratha or Roti Canai in some other parts of the world :). It is mostly sold by road-side vendors and usually in the evenings, people either set up cooking area in-front of their restaurants or just in some corner of the road and start making and selling these. There are different varieties of fillings that you can order but the meat filling is mostly made with beef. You can choose from meat only, meat and egg or egg only. The meat version goes really well with some sour salad or even with just a wedge of lime. Sometimes, I like to order egg only version and sprinkle some sugar on top or spread condensed milk and eat it as a sweet dish. Back home, people usually don’t make these at home mainly because it requires some skill in making these types of Parathas. Not only does the dough need to be quite smooth and elastic but the actual technique of pulling the dough paper-thin, requires some skills. It is certainly not impossible to make it at home, but back then at that time; when fresh Parathas are so readily available, why would anyone bother making them at home :). That being said, now that I’m living in a totally different environment, I would love to make these from scratch one day. For now, I’m using the frozen Parathas and so far they have worked out pretty well for me. I don’t like to use oil when cooking the Parathas because I think the frozen Parathas already have enough oil in them. The filling used here is pretty versatile and can be used to fill; puff pastries, Samosas or spring rolls. I’ve used ground turkey below but you can make with any type of ground meat; such as, chicken, beef or lamb. However, you might have to use more or less spices depending of the type of meat used. Combine ground turkey with chili powder, turmeric powder, salt, mix well and keep aside. Heat oil in a wide pan over high heat, and add garlic and ginger. Stir for few seconds and be careful not to let it burn. Add ground turkey mixture and stir well to combine. Stir frequently and break up the meat with spatula to prevent big lumps. Continue to cook on high heat until the meat starts to brown. Add black pepper at this point and make necessary adjustments according to taste. Stir for few more seconds and turn of the heat and remove pan from the heat. Add chopped cilantro, mint and jalapeno and mix well to combine. When the meat mixture is quite warm but not hot anymore, add the chopped onion and mix well. Let this mixture cool completely before warping in the Parathas. Place about 1/2 cup of filling in the middle of the rolled Paratha and shape the filling into approximately 5 x 6 inch rectangle. Fold over the bottom and top of the Paratha circle to the center. Fold over the sides to the center as well. You will end up with a rectangle shaped Paratha at this point. Place the Paratha on a sheet of plastic that comes with the Paratha package, keep aside or in fridge while wrapping the remaining Parathas. Heat a nonstick skillet over medium to medium low heat. Place one paratha, seam side down and cook for about 5 minutes in total flipping once or twice until both sides are golden brown in color and crispy. Keep the cooked Paratha on a wire rack in a warm place. Continue to cook the rest of the Parathas and serve hot with wedges of lime and onion salad. You can also add an egg during the wrapping process. After placing the filling in the center, crack one egg open and lightly spread the egg with a fork over the filing. 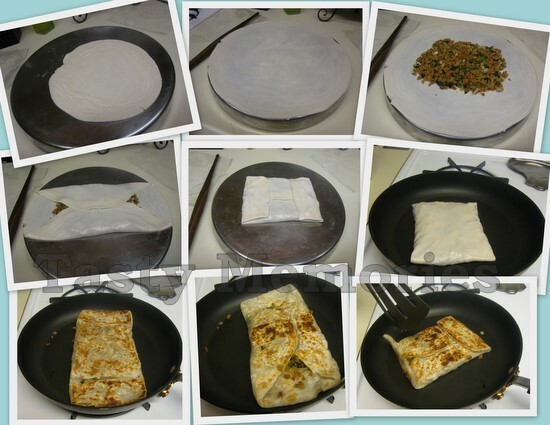 Wrap the Paratha as stated above and cook. While cooking the Parathas, sometimes, I like to open up the top folds, and brown the inner side for few minutes and fold back to its shape so that it can thoroughly cook inside. If frozen Paratha are too hard and breaks when you roll, leave it out few minutes longer for easier rolling. If they are out too long, it will be too soft, so put back in fridge or freezer to chill them a bit. You can lightly grease the work surface if Parathas are sticking or too soft. It looks delicious and just so mouthwatering.